Your trial of CPAP will last for a month. We have scope to extend trials if needed but in general this is enough time. For the first fortnight you will trial the AUTOSET device which allow us to determine an average pressure. This average pressure will then be used as measuring stick when trialling the Fixed Pressure device (Elite). If you have a specific pressure prescribed, we will use this for your trial. It is important for you to trial masks and your equipment before purchasing. There are several different masks so it is important to be comfortable with your mask choice before purchase. Our thorough approach during this trial sets a good platform for ongoing treatment. It is important to feel comfortable before moving onto ongoing use of CPAP. Throughout the trial process you will be contacted by us to gauge how you are going as well as review consultations along the way. 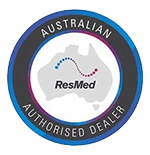 Your first month of trial costs will be refunded if you purchase a CPAP from Sleep Right Australia.